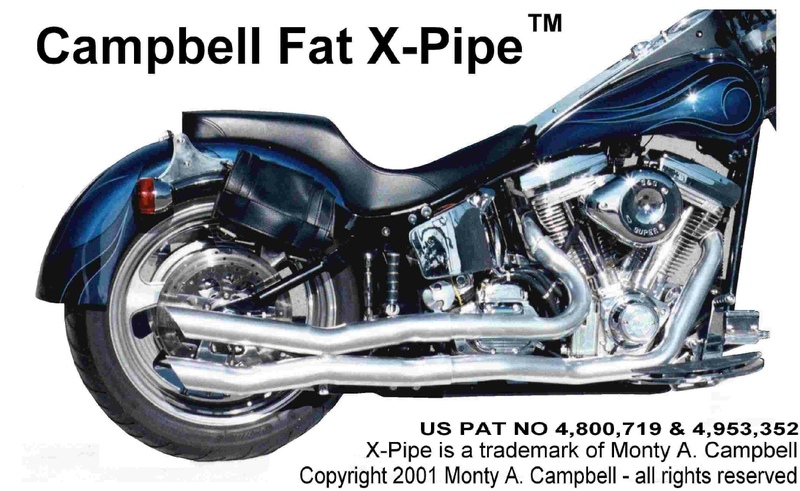 Daytona X-Pipe™, Campbell X-Pipe™, X-Pipe™ Header ™, X-Pipe™ Cross-Over ™, CPU X-Pipe™, and X-Pipe™ are Trademarks of Monty A. Campbell. All rights reserved. 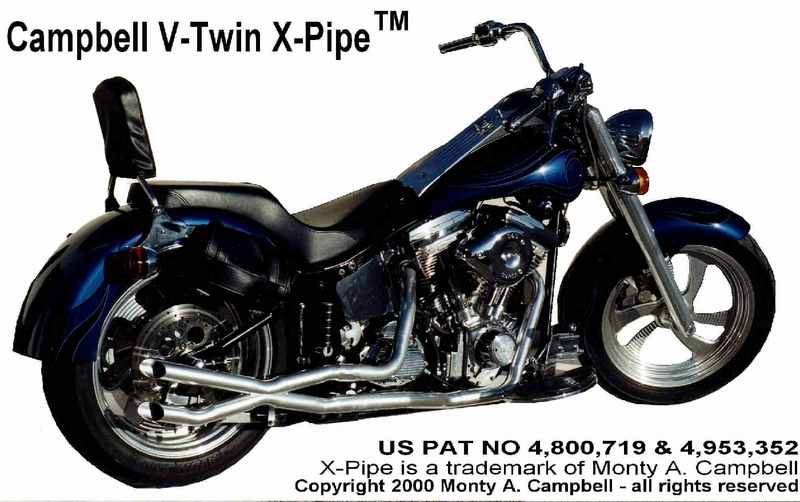 The Campbell V Twin X-Pipe™ exhaust uses advanced technology to produce more power. 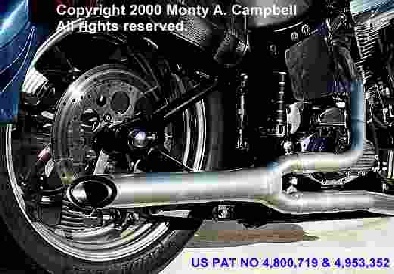 The Campbell V Twin X-PIPE™ exhaust is distinctive. It's not your grandpa's dual or two into one system. 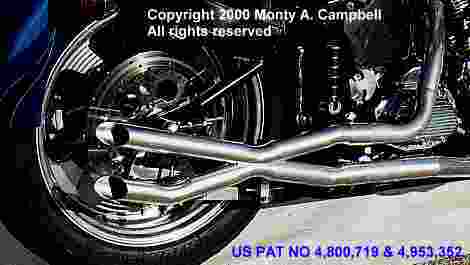 It is a true Campbell X-PIPE™ exhaust. High exhaust gas velocity produces maximum torque. Head pipe diameter steps up to 1 3/4" maintaining high exhaust gas velocity. Gone are the days of glowing and blue exhaust pipes. Campbell X-PIPE™ technology uses exhaust heat to generate horsepower, not fry the pipes and warm the planet. * Huge heavy heat shields are history. Campbell's V Twin X-PIPE™ exhaust not only runs cooler, it is smaller and tucked in so the rider can enjoy his bike without wrestling huge heavy heat shields. * Silencing technology increases power, reduces weight! 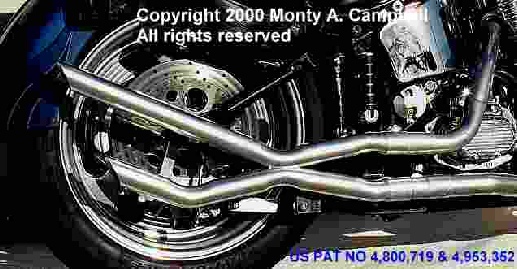 Campbell's V Twin X-PIPE™ exhaust produces a pure X-PIPE™ exhaust sound and reduces noise without heavy, power robbing mufflers. NO MUFFLER - NO PROBLEM! * Three collector styles to choose from.